This Instruction Article explains how to Mapper settings to alter content of the drop file for SENTINEL. There is a feature within Mapper program that can help you manipulate content of a drop file. 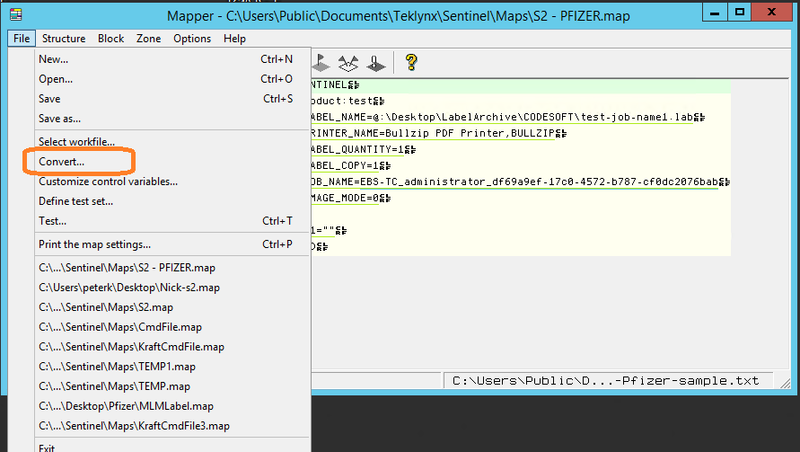 This feature can be found under File/Convert in Mapper. check this option if you wish to convert the tabs in your work file into spaces. The Number of spaces box allows you to specify the number of spaces representing one tabulation. check this option if your work file was generated by a system using the ASCII character set. check this option if your work file is coded in UTF-7, UTF-8, Unicode or Reversed Unicode. This will convert your initial file into a standard Windows text file. The From following coding list allows you to specify the coding of your work file. check this option to automatically replace one string of text by another before data analysis. This is an opportunity to modify data or to remove troublesome characters. check this option if your work file is an XML-format file generated using SAP’s SmartForms XML interface. Note: When making changes, be sure to click Apply before closing the window. Clicking OK appears to save the changes (they are there when you go back to the window) but they are not active.